The earth looked different at that time. The continents were on their way to their current place. 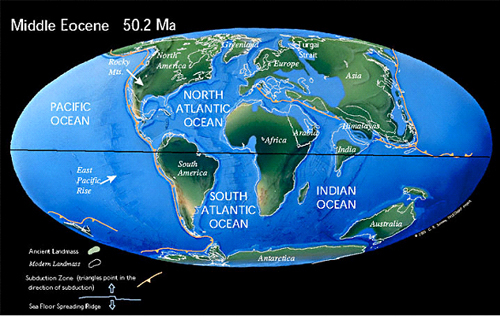 Atlantic ocean was more narrow, the Mediterranean had not yet been formed, in Asia there was a great inland sea. India was about to collide with Asia and the Himalayas had not yet been formed. Look at the map. But it was hot during this time. Much warmer. The ocean currents were different, the CO2 concentration was much higher. During certain periods of up to 2000 ppm. Some of the biggest predators were birds. 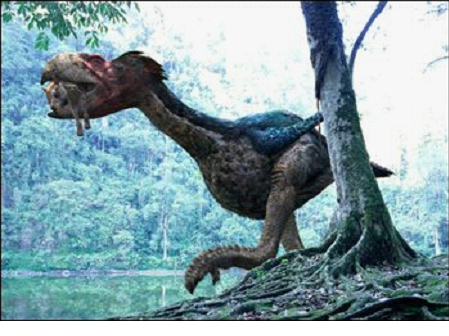 Pictured Gastornis. Another great bird was Diatryma as previously thought was a bird of prey, but now believe was a herbivore. The climate was warmer over the world, no ice in Antarctica even though it was above the South Pole. Even though it was so hot forrests covered most of the continents. The oceans was warm and full of life. Polar forests were vast. Up in Arctic Canada, Alaska and Greenland they have found fossils of tropical trees. If we look at the map from that time these places were situated almost at the same place as today. There is a problem with explaining that the earth was more even hot at the time. Hot at the poles without the tropics too hot. The first real whales show up and has been named Basilosaurus, a really great whale. The mammals are emerging more and more. 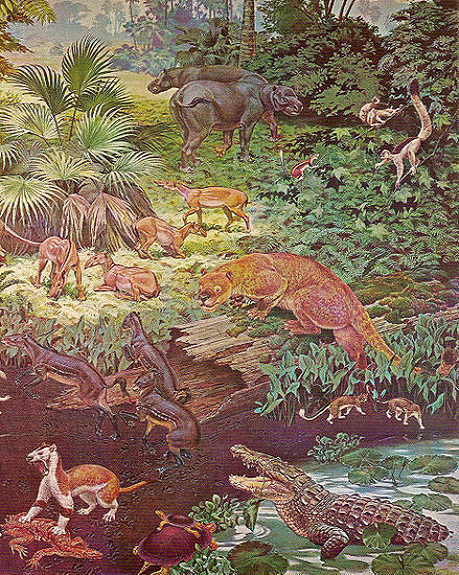 Largest mammal was a hippo-like creature.